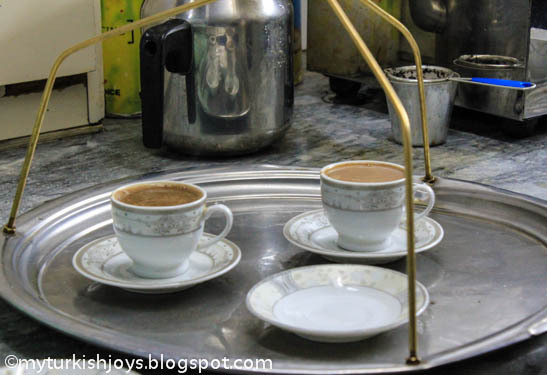 During my many jaunts in Eminönü, the intense smell of freshly ground coffee beans seems to follow me everywhere. 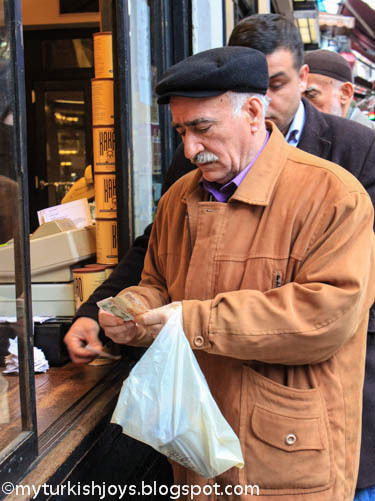 If you follow this irresistible scent, you will find at least a dozen people waiting in line at the small windowed-storefront of Kurukaveci Mehmet Efendi. This coffee shop has been roasting raw coffee beans, grinding them and selling freshly roasted and ready-ground Turkish coffee since 1871. 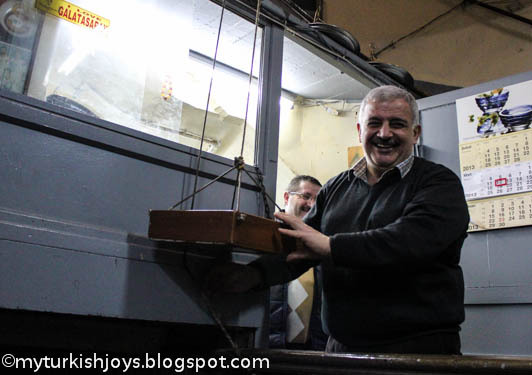 That year, at the age of 14, the shop’s founder, Mehmet Efendi, took over the family business, and today it is run by his grandchildren, according to the company’s website. I’ve seen a line here as early as 9 a.m. and as late as 6 p.m. Turks love their coffee, and you’ll see plenty of tourists buying it too. By the way, the line seems to move quickly. If you know Turkish coffee, then you know the global brand of Kurukaveci Mehmet Efendi. However, you might not know that the shop’s coffee beans are roasted in an unassuming building a few doors away. 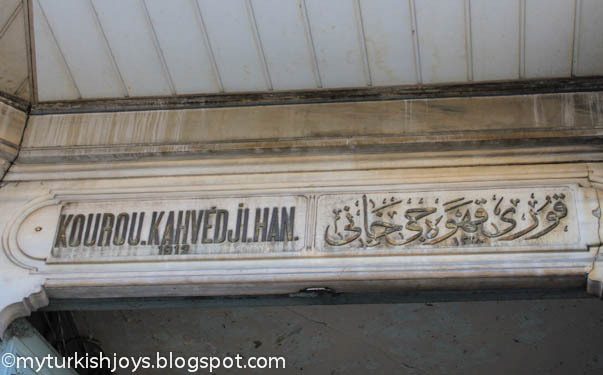 In the southwest corner behind the Mısır Çarşısı (Spice Bazaar), you will see a white Ottoman-scripted plaque dated 1912 like the one pictured below. Step inside this han and bypass the small store that sells cheap, 200-meter rolls of baking paper (my favorite), plastic drinking straws and colorful paper napkins. On your left, you will find rows and rows of burlap bags filled with coffee beans from Brazil. Behind a nearby closed door, you’ll hear the roaring sound of those coffee beans being roasted. To your right, you’ll see a small window where you can order your own cup of freshly made Turkish coffee or a glass of çay. Don’t be intimidated. Just grab a seat like I’ve done. It’s a unique place to take visitors. 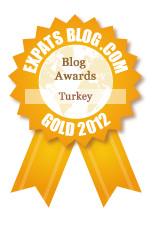 The guys are friendly and willing to chat a bit if you want to practice your Turkish. Then, sit back with your Turkish coffee and try to imagine all the footsteps that have passed through this Ottoman-era building. It may be a bit dingy now, but I'd say it just has character. 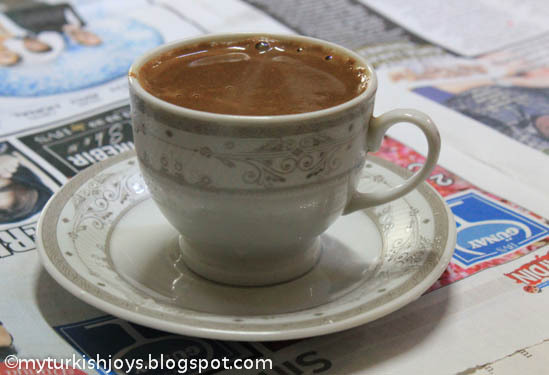 I'll drink Turkish coffee now and then, but I'd rather have a latte. 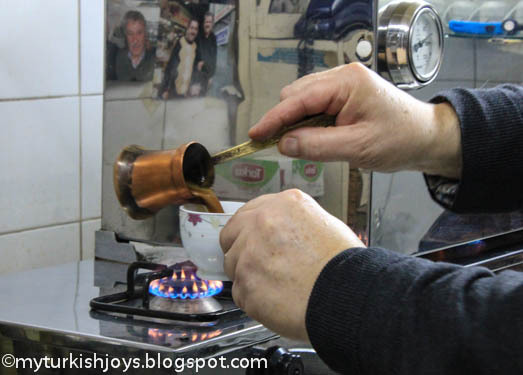 To learn more about Turkish coffee, check out this post from my blogger friend, Claudia, who recently wrote: Iconic Turkish Coffee - Turk Kahvesi. 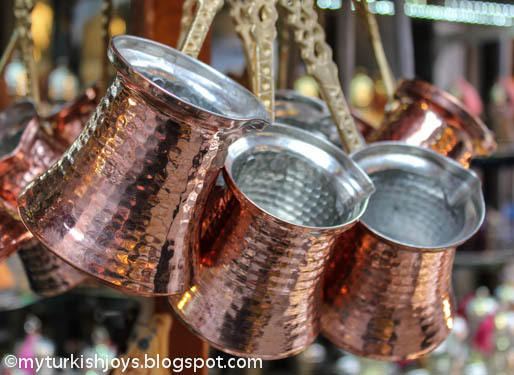 Traditional copper cezve - or the cooking vessel of Turkish coffee. 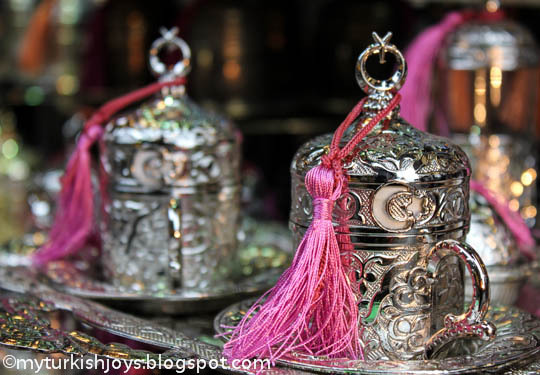 Fancy, silver Turkish serving cups with lids so the coffee stays hot! 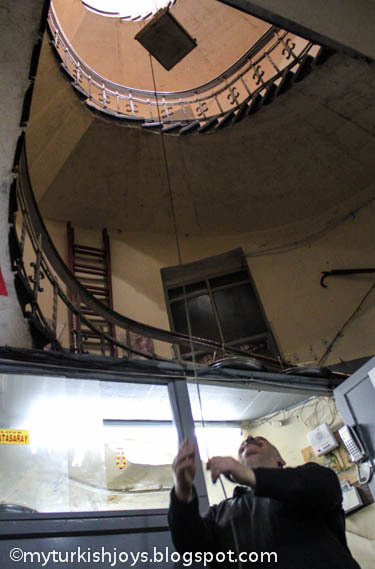 This is how you deliver a cup of Turkish coffee inside the han. These Turkish guys were such great sports and posed for my photos. More customers in line at Kurukahveci Mehmet Efendi. i would love to try one of these! i am very happy that we have a city ful of coffee roasters so i get the smell as well as good coffee! @Joyce, yes, I think you would love the Spice Bazaar area! It's full of foodie finds. I bought a pack of coffee powder from this store and 2 more packs of the same brand from the supermarket. Like the freshly ground one much better! Also love the brown paper it comes packed in! I think I went to the shop that sold the 200 meters of baking paper too! Bought some napkins!